Breck has the best skiing and night life with a cozy town feel. I would put Breck as my second favorite resort with Whistler being my number one. Vail isn't to shabby, but has a hefty price tag and lacks the night life that Breck offers. One simply cannot describe Breckenridge without alluding to the divine. A veritable cornucopia of extended lifts and runs, Breckenridge manages to cater to the elite skier, with a sublime array of bowls and tree runs, while simultaneously cradling and accommodating the novice in her soft, powdery bosom. Much can be said about the town of Breckenridge as well. Take my advice: Go to Eric's, order the wings, and play skee-ball. 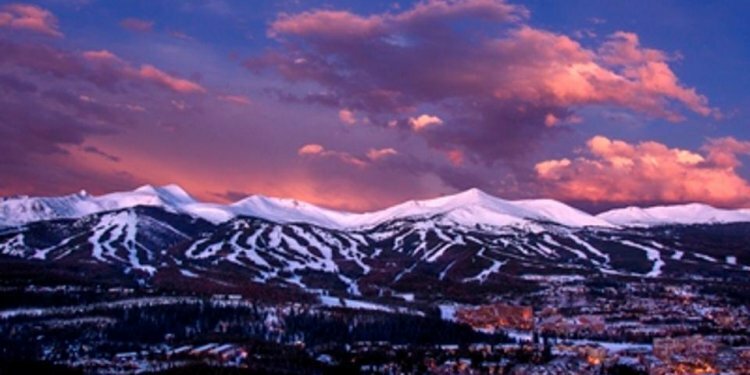 Breckenridge is probably one of the closest ski resorts to Denver. It is easy access from the freeway and the views of the mountain while driving in are spectacular. Breck is a must visit place in both the winter and the summer if you are in the area. The town is still lively in the summer and even more in the winter. The ski resort offer a great variety of runs and terrain. The newly added Peak 6 adds even more to the already large resort. Overall there isn't really anything bad to say about it! Visited 2-27-2014 to 3-5-2014 with 6 other family members for the Mardi Gras Holiday from New Orleans, LA. Stayed at Crystal Peak Lodge on Peak 7 and loved it. We last went to Breckenridge 30 years ago and it has expanded tremendously. We have already made plans to go back to Breckenridge for Thanksgiving 2014 and Mardi Gras 2015. It was so much fun that we cannot wait to go back. I love this resort more than any other! Breckenridge has it all. The gorgeous town really made my trip! The atmosphere is just everything you'd want. The staff and people are all so nice and easy going. Now to get to the skiing! I really like Breck because they have trails for all type of skiers! Now with the new peak 6 there are even more trails. They also offer lessons and a kid center for little ones to learn which is convenient. The crowds are also very manageable. I went the first week in January and there was no problem with the crowds. I would definitely recommend Breckenridge. Breck is number 1! Really enjoyed the stay and the skiing was great. Doesn't have the huge bowls of Vail or Winter Park, but would, and hope to, return again. Conditions were excellent as well as access. Only issue I can think of was the ticket line and the lift lines at the bottom. Year after year, Breckenridge never seems to disappoint. They had a lot of snow this year! Simply love it! Had never even heard of Breckenridge, as it is overshadowed in the west coaster's mind by Vail, which sits about an hour away. However, this mountain blew my expectations out of the water. It's huge, has plenty of solid blue runs for intermediate to advanced enjoyment and beautiful views from a multitude of unique peaks. Very fun to navigate, great snow, and lovely little town. Loved it!